The NEC DT730 VoIP phone is technically the same as more expensive models in the DT730 range (DT730 24D and DT730 32D). The key difference between the models is how many customisable one touch buttons they offer – in this case there are 12. The 12 programmable buttons offer LED indicator lights which show status of lines/staff etc whether they are busy or free. This traditional style flashing LED feature actually makes the DT730 12D VoIP phone very easy to use and is easier than scrolling between screens on some IP handsets. For the average staff member 12 buttons is more than enough even in larger companies as few people actually need to see all staff. This is the standard phone in the NEC DT700 IP series handsets. The NEC DT730 ITL-12D IP Phone is easy to use and well designed. One of the good features is the screen is backlit. This makes it easier to see than the cheaper NEC DT710 6DE IP phone. Below the screen are 4 context sensitive keys. These show corresponding commands on screen above them. The reason they are context sensitive is they change depending on which features of the system you are using at a given time. For example, if you are on a call it will only present with logical options like transfer, conference etc. If you are using voicemail, it will only show voicemail commands. This is much easier than having to navigate around the handset to find the same options. This type of feature is now quite standard on most digital and IP phones from all the leading brands for this very reason. The NEC DT730 12D VoIP phone also has a navigator jog dial located on the bottom right of the console. This allows for faster and easier access to system features like directories, redial etc. This is great for staff that are constantly dialling the same customers. With many handsets that have programmable buttons you have paper inserts and write names on them. The DT730 12D is no different and is one of the few drawbacks of the NEC IP range (except DT730 Desi Less and DT750). Other manufactures have opted for on screen displays on their IP handsets which alleviates this completely. The sound quality on the NEC DT730 ITL-12D phone is excellent both for the handset as well as the speakerphone which is full duplex. Many handsets are not full duplex which is the same technology offered by advanced conferencing solutions from Polycom. It allows for multiple people to talk and be heard clearly on a conference call at the same time. Without full duplex it can be a little problematic and voices may get clipped or experience sound loss. The handset also offers wideband audio in the form of G.722 CODEC. This delivers a richer, more natural sounding IP user experience. Wideband simply takes a wider range of the audio spectrum audio as opposed to narrow band. Technical yes but the result is very good. The DT730 12D phone comes native with two 10/100MB LAN ports. This allows you to run both your PC as well as your handset from a single Ethernet connection. If you are considering, or have a Gigabit environment, there is also an optional Gigabit adaptor available for all NEC IP handsets. This is an important factor as some cheaper model handsets do not offer this and it may be a serious consideration for your company especially if you are running the PC and Phone from the one port. As the NEC SV8000 pbx phone systems are all hybrid you can connect not just IP but also digital and analogue phones as well. This is actually a very important fact that many resellers choose to gloss over. For a company that already has existing phone and data points you don't need to have IP handsets - even if you're using SIP trunks (VoIP) for your phone calls. Digital handsets offer the same user features and only really miss out on XML interface which allows external applications to be used on the phones. By choosing digital you don't require POE and the handsets are cheaper than their IP counterparts. In a typical deployment the handset price difference can potentially save you $1000's without compromising the system functionality at all. If you are considering phone handsets then you should check out the NEC DT330 12D digital phone. It is identical in terms of looks and features and is cheaper. The digital models have been designed to be identical to the IP models so you can mix and match easily without having different looking handsets around the office. The NEC ITL-12D VoIP phone is easy to use, intelligent and feature rich and is a very good VoIP phone handset for everyday users. Infiniti Telecommunications is not affiliated with the manufacturer of this product in any way. 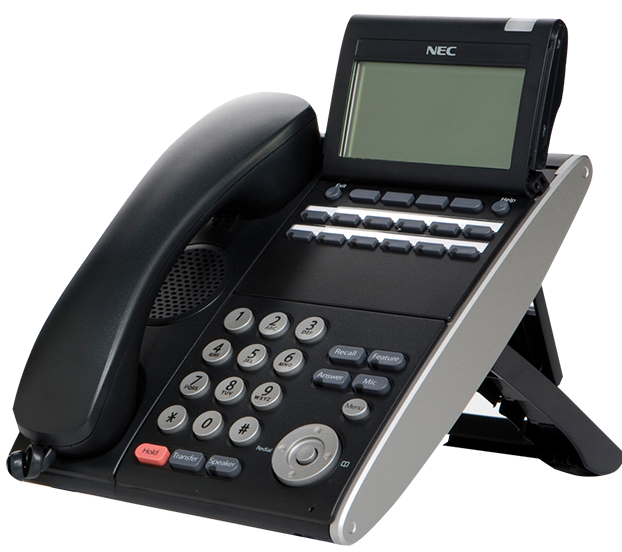 Looking to learn more about NEC DT730 ITL-12D IP Phone Handset?